I have been wanting to write this post for so long now and I'm so glad I'm finally doing it. I have definitely purchased quite a few art supplies this year and I'm very happy about that. I guess it just motivates me when I buy new supplies. I really wish I had copic markers though but they are way too expensive and I don't understand how people afford them but one day I will afford them. 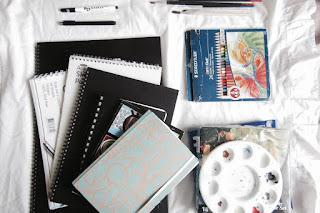 I'm really happy with my art supplies and I'm looking forward to continue purchasing some cool stuff next year. I really enjoy trying out new things and seeing what I can do with them. I forgot to include my pencils in the picture but I use a set of 6 Steadler pencils. I bought most of my art supplies from CNA, PNA or Crafters Market. If you have any more questions feel free to ask.